It was when Cullen was painting Anita Cobby’s murderers for an exhibition about Cobby that Naseby began to think about painting Cullen’s portrait. Born in England in 1937, Naseby studied at Northampton Art College. He came to Australia in 1953. After working as a rouseabout in Queensland, he studied at Queensland Art Gallery before moving to Sydney where he worked for various magazines and publishers. He has painted full-time since 1992. He has been an Archibald finalist on four previous occasions and has been in the Salon des Refuses three times, winning the People’s Choice last year. 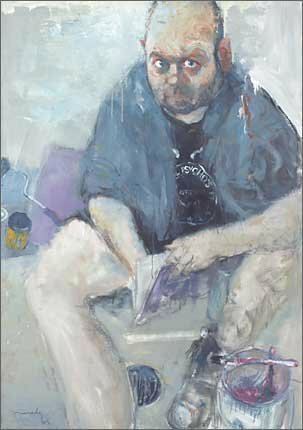 He was also a finalist in the Sporting Portrait Prize in 2000 and a finalist in the Keduma Drawing Prize in 2000 and 2002 and is represented in this year’s Wynne Prize. He has had solo exhibitions at Charles Hewitt Galleries in 1999 and 2000 and was awarded a Bundanon Fellowship in 2002.